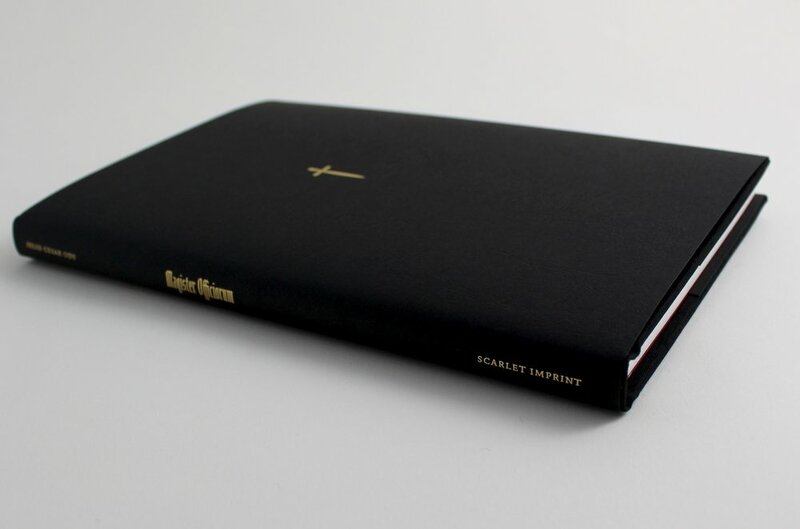 Limited to 72 copies, hand bound in quarter vellum, black cloth boards, custom marbled endpapers, all edges gilt, ribboned, and presented in a slipcase. Entering the darkened room, there is a foreboding strangeness as if the moment had occurred before. It is always like this, on these eventful occasions. I sit in front of the idols and tools of the many strange ones who have brought me their boons. As is customary I speak their names to greet them and let them know I am here. Coals are lit and placed in the brazier at the foot of this arrangement. I clutch the top of the cane between my legs with both hands when the usual dizziness assaults my body which is now rocking slowly back and forth. My eyes are closed. In monotone mumble they are named all over again, and then the once living who knew them too, and their lineages. My feet feel uncomfortably as if they are resting upon hot cinders and the smell of burnt wood is strong enough to give me cause for concern. I open my eyes and the wall behind the idols is transformed. There are now numerous symbols other than the ones I drew there myself and along the centre runs a spine with a goat head atop of it. That is the Lord of the Forest and this is how he stirs visions. I cast the appropriate materia into the brazier, in this ritual whose aim is to to cast my vision into the far depths where those cursed with insatiable hunger for power and crushed under the weight of success dwell. I have met them before. Their character is as once human, but not quite so anymore. Sharply, a waking dream floods into reality. The cane becomes as a thin, unnaturally tall tower, and a giant serpent enters through a small window near its summit. I shut my eyes in order to see more clearly. Now comes a vision of a hole of seemingly infinite fiery depth, into which descends a stone totem of countless crouching beings wrought with despair. From within this pit arises a whirling swarm of flesh-eating insects, ravaging the carcasses of people and animals it found in caves on its ascent. I open my eyes again and behold this presence as it broaches into the waking world, the room suddenly grows cold and dark, and a horrible anguish and blackness of thought ensues. I endeavour to communicate by asking its name, to which I receive no reply. At this point the gloom is so overpowering that death feels like a perfectly reasonable option. All plans fail, all effort is futile, everything leads nowhere. Whatever strength I have left is used to call upon others to rescue me from that horror. The presence wanes and the dreadful feeling haunts me for the entirety of the next two days. On the Wednesday that follows, the day of honouring The Spider, things are again eerie, anomalous. The presence following the pomp and ceremony is not the one expected, but altogether something else. In the mirror put in place for the occasion there appears a decrepit humanoid figure with no eyes. I resolve to discover who deigns to break into ceremonies that do not belong to them, and ask again its name. It discloses it along with its character and how it is to be called so that its arrival would be painless to me. It then speaks at length on the nature of the spirits whose signatures are in the room, amongst those several who are found in the Ars Goetia; it calls them serpents of fire and tells of their many skirmishes with magicians of the past, the chains they laid on these spirits for restraining and commanding them, their connection to Heaven above and of the untold ills perpetrated on Earth by evil-doers with their aid. Finally, incense is to be burnt upon the arrival of the spirit, charges issued, and their signature hidden in a designated vessel to safely contain their power after their dismissal, and from whence they can be drawn forth and bidden to perform services again for they are said to be as unpredictable as they are formidable. Before departing my company, the spirit proclaimed that several amongst them are put into service by God for running errands on Earth, during which time they are given more freedom to intervene in Earthly affairs. Precise knowledge of these occurrences is thus extremely valuable and can be gained through divination carried out with the aid of well-placed spirits, or more directly by binding them into service. The unknown factors of this magic pertain to knowing how and when the spirits have been so tasked. Acting on this knowledge with precision and power can be quite perilous, it stated, as the more it is done, the greater is the likelihood that the magician will become a target for powerful competing forces. Such is the ghost that accompanies this quest, like a stalker concealed in the woods as we travel down a risky road. Here, the key that was availed for beholding their visages is given in a form that can be pursued by any who would risk their life for knowledge of the secrets they guard. I have furnished the precautions that are known to be efficacious in this art. Know, however, that they are the ones whom we all unknowingly fear at our deepest levels. The apple can, with these provisions, be safely plucked from their grasp, but what will then come from the eating of it, poison or power, is ours to own. This particular addition to modern goetic literature is a splendid illustration that contemporary grimoirists occupy more than two camps, in the Real World. The author addresses the appearance of 'eclecticism' in the methods he describes; these certainly depart from the usual Anglophone 'grimoire purist' camp, for example in drawing directly upon initiated Caribbean traditions. While the Goetia of Solomon is the primary focus, other key works – such as the Hygromanteia – are involved in the synthesis, particularly regarding some procedures and ritual items where the GoS is unclear or inadequate. The author is also rightly dismissive of eclectic routes that simply select the least inconvenient options. This is a difficult, dangerous and painstaking art, and while 'by rote' purism underplays textual and other problems, addressing these experimentally within traditional parameters is not to be confused with skimping. Julio exemplifies the anticipated breakthrough in rectifying Goetia via access to Living Traditions outside the "Anglosphere", and this is a very welcome, groundbreaking addition to the literature. While polemic, exhortation and explanation is present, the work is profoundly practical. Particularly interesting is the inclusion of potential group rituals, drawing on Espiritismo 'seance' and other traditions suited to the reinvigoration of the Art in our times. This slim volume punches far above its weight; congratulations for a first class and genuinely ground breaking work are in order. Every now and then you hear someone bring up the fact that the Ars Goetia and other grimoires all receive some “off-book” treatment in Africa and the Carribbean. Maybe someone loosely mentions something about Obeah, or Makaya, or Espiritismo and these books, then uses the fact that these practitioners don’t follow the texts to the letter as justification for whatever spin that they have on the work. Most often the approach that they are trying to justify is nothing but laziness masked as innovation. What you almost never see is anyone spelling out exactly what some of the Obeah or Trinidad Khabbalah approaches to the grimoires actually are. This text clearly shows that there is nothing lazy or “light” about the approach to the spirits taken by these Caribbean Mages. Julio has spent years cultivating not only an understanding of the Solomonic texts and how to perform them step by step, but has also cultivated connections to practitioners of traditions in Brazil, Haiti, and elsewhere that work these spirits beyond the books. Then he put his frequent flyer miles where his mouth is and went and visited people and got trained in person. In Magister Officiorum Julio gives us not just a few tantalizing hints, but several rituals laid out for anyone willing to put forth the effort and time. Books do not have to be long to be valuable, and this book comes in at only 80 pages. Those 80 pages present the pith of the work, and you will gain more from understanding and practicing these 80 pages than most books thrice its size. How he manages to pack in not only crystal clear instructions on how to perform the rites, but moving descriptions of the spirits and their personalities is itself a magical feat. This is a deceptively slim volume, admirably concise yet nonetheless richly evocative (see what I did there). Its pages breathe lived experience (Julio is a seasoned Solomonic magician and initiate of Brazilian, Haitian, and Jamaican magical traditions) and Julio engages with his readers in an honest, matter-of-fact, unblinking fashion. He demonstrates deep and rigorous familiarity with traditional procedures and materials, without putting text before or above practical experimentation and experience. His text machetes a clear, walkable track through the jungle of existing, often contradictory and confusing interpretation and claims, offering unusually clear and practical insight in a field so often given to obfuscation and compensatory embellishment. While Julio’s respect for the powers and mysteries at the heart of the tradition is clear, he is never coy, precious or gratuitously grandiose when it comes to discussing ‘secret’ knowledge. Julio makes clearer than any treatment I have hitherto seen the specific quality of the kinds of relationships that are at the heart of this tradition. His description of the form and function of procedures relating to the commanding, taming, binding, and making of pacts with these hot, unruly spirits is extremely lucid and is very parallel in some ways with Tibetan tantric orientations as well. One of the most remarkable features of the book is the extent to which Julio acknowledges how this is a system that is meant to evolve as ritualists themselves do through increased contact with spirits. Julio’s central aim is to show readers how they can use miscellaneous methods scattered throughout Solomonic manuscripts to successfully forge specific spiritual relationships through which ways forward in and through the system can become increasingly self-evident and personalized over time, via direct revelation. No-nonsense expertise but also hard-won humility runs throughout the book. As Julio has said to me, this is “a rather gnarly path which not many people will put to use, which is maybe a good thing.” As such, I appreciate how in his book Julio makes the demands and risks of this practice clear, without alienating his readers or using his practical reports as an excuse to lord his authority. Many authors in the field of writing on Solomonic magic have taken the “I have rediscovered the missing key to the ancient tradition (i.e. completely reinvented the system)” or ‘I am a powerful and dark mage and you all are not as wise or worthy or accomplished as me, shudder before me!” blah blah approach. Julio takes neither. The closest comparison I can think of for this book is John R King’s account of his own results working the Keys of Solomon, as found in his ‘Imperial Arts‘ and other volumes. Julio and John have many things in common but are also working from quite different angles and worldviews. Julio doesn’t agree with John’s interpretations of what exactly the spirits are all about but it is interesting and encouraging to see that the two authors meet very much in the middle when it comes to reporting on their practical results and experiences. Ultimately, Julio’s book is one of the first devoted to Solomonic magic traditions that has made me feel like granted the right time, resources and dedication I could engage with and make progress in these traditions myself without having to cut corners or needlessly rework things. This is a welcome, valuable contribution to the growing literature on the ‘grimoiric revival’ and I am very grateful to Julio for making it available. I am not experienced in the practice of Solomonic magic, so my opinion is probably not worth very much here, but if you’re at all interested in this topic, I strongly recommend getting a copy.